Film available online (can't link to it directly though--go look for yourself! ), which is one reason why I'm reposting this. No English subtitles, alas. 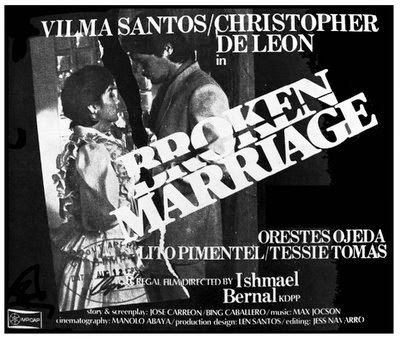 You might say Ishmael Bernal's Broken Marriage (1983), his follow-up to the successful melodrama Relasyon (The Affair, 1982), isn't quite as commercially or critically successful (the film's star Vilma Santos managed to sweep all acting awards with her performance in the previous production). I suppose it's easy to see why: the earlier film looks at marriage from an unusual point of view (from the outside, or from that of the mistress); the earlier film has a relatively streamlined and somewhat titillating story (a man estranged from his wife moves in with his mistress) with a suitably dramatic finale (death by aneurysm, harrowingly shot and staged by Bernal in a single take). One sees what made the latter so successful, the same time watching this one sees why Bernal didn't want to simply duplicate that success. Relasyon was a lean and elegantly told melodrama that took a sidelong look at the institution of Filipino marriage; in Broken Marriage Bernal wanted to focus on the institution sans oblique glances. He didn't want to film some doomed struggle to keep love alive but something less dramatic, far more difficult to capture: the aftermath of a protracted war, where the ultimate casualty is married love. He in effect didn't want Ms. Santos at her perkiest and most energetic--he wanted her exhausted, looking for a way out, and to her credit Ms. Santos delivers. The film is a gem of contemporary neorealist drama not the least for what it doesn't have: soapy music (what little there is sounds incongruously cheerful, an ironic ditty for some kind of happy little family movie), fancy production values (the middle-class houses look as if they were actually bought and furnished using middle-class incomes), histrionic acting. As a kind of sly commentary on this Bernal has the wife Ellen (Vilma) working as production assistant to a TV director (Tessie Tomas) working on an endless series of soaps. In one scene Ellen looks on as soap husband and soap wife take the familiar pose of classic melodrama (staring off into the distance, with an expression of haunted tragedy on their faces), intoning kilometric lines of bathetic woe. Contrast this with the fight she just had with her husband Rene (Christopher De Leon, who played philandering husband to Ms. Santos' martyred mistress in Relasyon): messy, unlyrical, jagged in rhythm and emotion and dialogue (one wonders if Bernal had the actors improvise their lines), with an unsatisfying resolution. It's actually remarkable how Bernal without being too obvious about it manages to refract Ellen and Rene's marriage several ways. Aside from seeing it through traditional pop media (the television soap), we see it re-enacted through the quarrels of a gay couple--Rene has at this point moved out and into a house serving as residence to an artist's community. He's eating breakfast when suddenly one lover runs down the stairs and starts yelling at the other, who sits sullenly, listening. You can see Rene reacting as he recognizes some of the words--similar if not exactly the same as what Ellen has yelled at him, time and time again (this, incidentally, could be considered one of Christopher De Leon's subtlest, finest performances--impressive, considering he's not known for understated acting). Likewise, when Ellen has moved into her mother's house we (as well as Ellen) recognize ourselves in her younger sister and boyfriend albeit at a younger age, with love still in bloom and marriage an unknown adventure. Again the contrast--the occasionally tempestuous love between two youths and the steadier flame between two veterans: scarred, wary, wondering how much more of this they can or need to take. Bernal shoots most of the film in a series of long takes, much as he would to capture a performance onstage; he has the camera move to frame and reframe actors when they argue, sometimes indicating a shift in the power struggle between them. When the argument goes on and on Bernal's camera takes on an unblinking, relentless quality, refusing to turn its gaze until frustrated husband and infuriated wife have hurled their last venomous barb at each other and are left, weaponless and exhausted, on a devastated plain. The film ends with Rene moving into Ellen's mother's house, and the two attempting reconciliation--an ostensible happy ending. But: one has to remember that the two finally turn to each other when they have no other alternative, when their prospective lovers fail to measure up, when they could not tolerate yet another night alone in bed. Marriage is a slog, a neverending struggle, a source of constant pain--but there are less palatable alternatives out there, and you can do much much worse than to just stick with each other and try make it work. As for the reconciliation? Not a guarantee; an accommodation, a ceasefire ready to be withdrawn at the first sign of struggle. I wouldn't trust them to stay together past the end credits--would you? When I told Ishmael Bernal I liked Relasyon better than Broken Marriage because the former seemed more taut and complete, he replied that it was because the latter was less about marriage itself than the breakdown of institutions. In a sense, this film is the second of a trilogy about such breakdowns which began with Manila By Night and completed with Hinugot sa Langit. Manila I think of as an epic, Hinugot a film about abortion. I can see Relasyon and Broken Marriage as being a pair--the one about a relationship outside of marriage that survives till death, the other a relationship inside of marriage that gutters and almost flickers out, but survives, albeit provisionally. If anything, Broken can be comparable to Rossellini's Journey to Italy, down to the 'happy' ending. Maybe they stay together, maybe not; the point is the ambiguity. Singapore International Film Festival 2017!